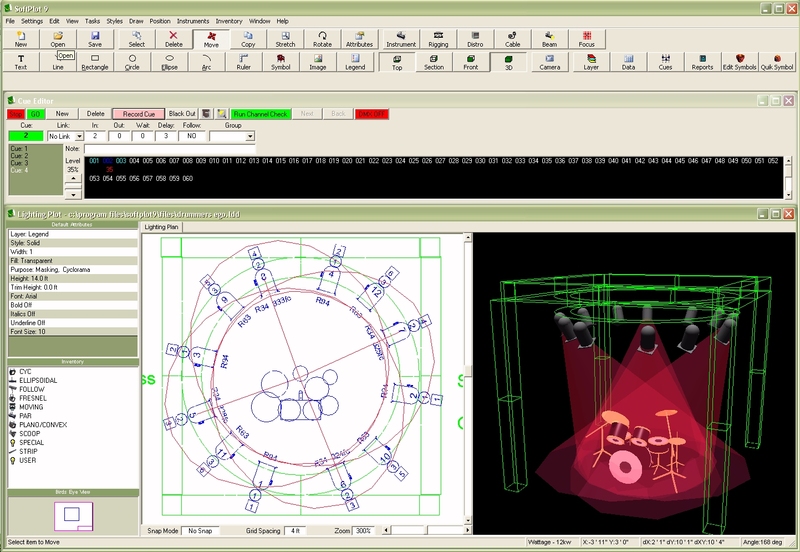 SoftPlot is a CAD application specifically for lighting. Plot lighting, manage paperwork for all levels of entertainment from theatre to film to TV and is great for students and professionals! 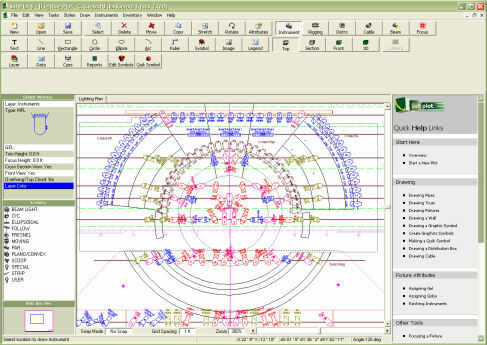 SoftPlot is a graphical design tool that makes it easy to drag-and-drop lighting fixtures, trusses, and other elements on the design surface. You can take a bird-eye’s view and see your design in Plan, Cross Section, and Elevation views to make sure all your sightlines and focuses are correct! Working with SoftPlot will greatly increase your productivity during design time. SoftPlot will also mange your paperwork from gel lists to instrument schedules. SoftPlot can import and export DXF files and can also import other formats such as Bitmap and JPEG to add backdrops and set pieces. Printing is easy with SoftPlot as it can output to any printer or plotter supported by Windows. Many options are available from color to page sizes. You can also create and print reports of inventory, pattern listings, channel schedules, and others. Easy to understand toolbar with optional captions. The outline of the selected drawing sheet is displayed to easily visualize the finished document. The Inventory selection tree list includes a picture and quantity for quick reference. “Smart Hunting” of drawing items such as line, text, fixtures. Up to 20 drawings onscreen at a time with each their own scale and paper size. “Quick Symbol” function allows you to place custom or customized symbols easily on your plot. Instruments can be assigned multiple gobos and 30 different accessory options from donuts, safety chains, floor stands, and more! The Crescit Cloud Services window connects SoftPlot for sharing your SoftPlot design project and to get the latest gear into your inventory using your internet connection. The Home tab is where you get the latest news about updates and what’s happening with SoftPlot. The Online Projects tab lists all your Projects you have saved to the cloud and provides the function to upload your SoftPlot design. Manage your Projects “online presence” by setting sharing, adding images and making a gallery all managed through the site www.crescit.com making it accessible to anyone you want. Easily access the latest video tutorials to learn more about how to use SoftPlot. Getting new fixtures with their symbols into SoftPlot has never been easier than with the new Fixture Search App. The more than 11000 fixtures in the ever growing database your well connected to the steady stream of new gear on the market today. The GOBO Search App has more than 10000 images of gobos from the leading manufacturers making your selection of gobos faster than ever. The GEL Search App provides the latest filters from the major manufacturers so you can quickly and easily add them to your SoftPlot design project. The Cloud Services are provided by www.crescit.com, and are included in your SoftPlot Subscription. Feel free to email us or find us on Facebook.